Ericka Ukrow is a Senior International Trade Specialist specializing in Financial Services at the International Trade Administration. Meeting of the TFAC, February 22, 2018. From left to right front row: TFAC Chair Kevin Klowden, Commerce Secretary Wilbur Ross, Commerce Deputy Assistant Secretary for Services James Sullivan, Designated Federal Officer for the TFAC Ericka Ukrow. 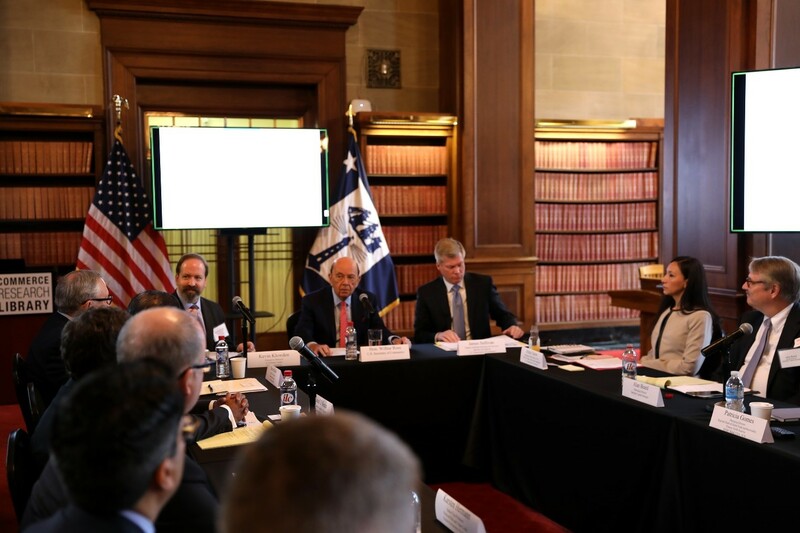 Exporters, lenders, and researchers are working together to improve options for trade financing through the Department of Commerce’s Trade Finance Advisory Council (TFAC). In an increasingly interconnected global economy, trade is taking a prominent role in our country’s economic growth. Meeting of the TFAC at the Commerce Department, February 22, 2018. 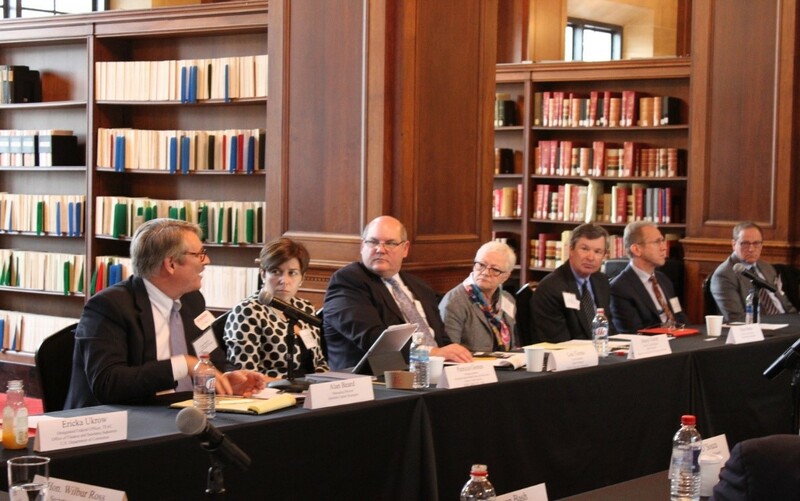 From left to right: Alan Beard and Patricia Gomez (new members), Lou Tierno – Fulton Financial Corporation, Stacey Facter – Bankers Association for Finance and Trade, Peter Bowe – Ellicott Dredges, Gary Mendell – Meridian Finance Group, David Herer – ABC-Amega. Russell D’Souza, Vice President, Corporate Treasurer, Hanesbrands, Inc.
Patricia Gomes, Managing Director, Regional Head Global Trade and Receivables Finance North America, HSBC Bank USA, N.A. Meeting of the TFA at the Commerce Department, February 22, 2018. 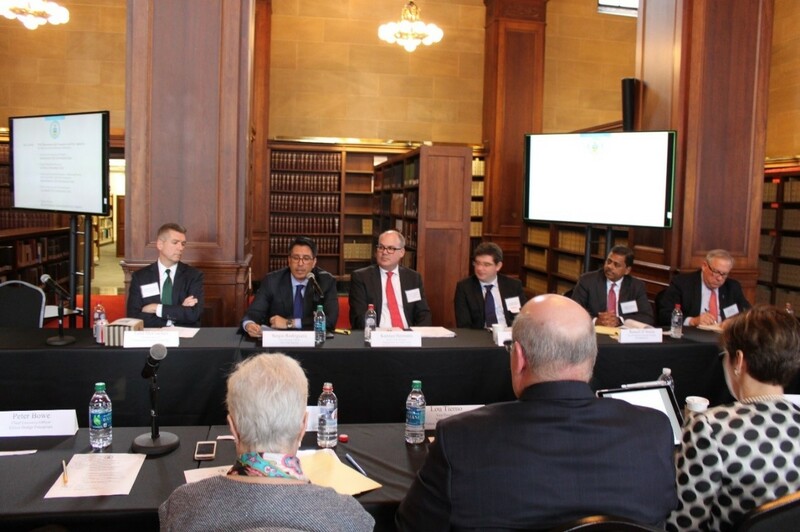 From left to right: Todd McCracken – National Small Business Association, Sergio Rodriguera – The Credit Junction, Karsten Herrmann – Munich Reinsurance America, Tim Gaul – Caterpillar, and new members Russell D’Souza and Steven Bash. If you would like to learn more about the TFAC, you can visit our website or you can contact us at TFC@trade.gov. If you are interested in becoming a member of the TFAC, stay tuned! The Council may be looking for applicants this summer. You can learn more here. The Trump administration is analyzing the causes of America’s persistent and massive trade deficits. U.S. Secretary of Commerce Wilbur Ross is asking for input from American stakeholders on the factors that contribute to the more than $500-billion-annual goods and services trade deficit facing the United States. The comment period is already underway with the deadline for submissions on Wednesday, May 10. The Department of Commerce and the United States Trade Representative will hold a public hearing on Thursday, May 18, at the U.S. Department of Commerce in Washington D.C., at 9:30 am. This hearing and request for comments allows all American stakeholders to provide relevant information on the effects of international trade with the countries with which the United States has significant bilateral trade deficit in goods. Reducing or eliminating these trade deficits will usher in a new era of prosperity for American companies and workers. If your company or industrial sector is experiencing problems exporting goods or services to China, Mexico, Europe, Japan, India, Korea or any other major foreign market, then we want to hear your story, as well as your ideas on how to fix the trade deficit. We also want to hear from you if your company or sector is being harmed by illegally subsidized or dumped foreign imports. Comments will be submitted in a report to President Trump. This information will help the administration renegotiate trade deals and more effectively deter and punish trade abuses when they occur. Differential tariffs, non-tariff barriers, dumping, and unfair subsidies have reduced exports, harmed American workers, and shuttered U.S. businesses. The report will include an examination of how the United States’ trade relationships impact job creation and wage growth at home. Information on submitting comments or requests to appear at the hearing can be found here. You are currently browsing the archives for the Trade Policy category.